The oldest building in St. Petersburg, Russia, the Peter and Paul Fortress, situated on Zayachy Island, not only served as the burial grounds for Russian emperors, but also as a former political prison for the country. One of the last few fortresses that is still standing from the 18th century, the Peter and Paul Fortress is the point from which St. Petersburg developed into the magnificent city that we know it as today. Originally established by Peter the Great in May 1703, the Peter and Paul Fortress was initially built in order to protect the city from an attack from Sweden. This attack never happened, and in 1720, the fortress began to serve as a prison for political prisoners. The fortress was attacked in 1917, and its prisoners freed, and it was not long before the fortress fell into Bolshevik hands. However, 1924 saw a change of fate for this incredible historical landmark, and it was converted into a museum. While it did suffer some damage from the second world war, restoration projects were carried out, and the fortress remains as one of St. Petersburg’s prime attractions. 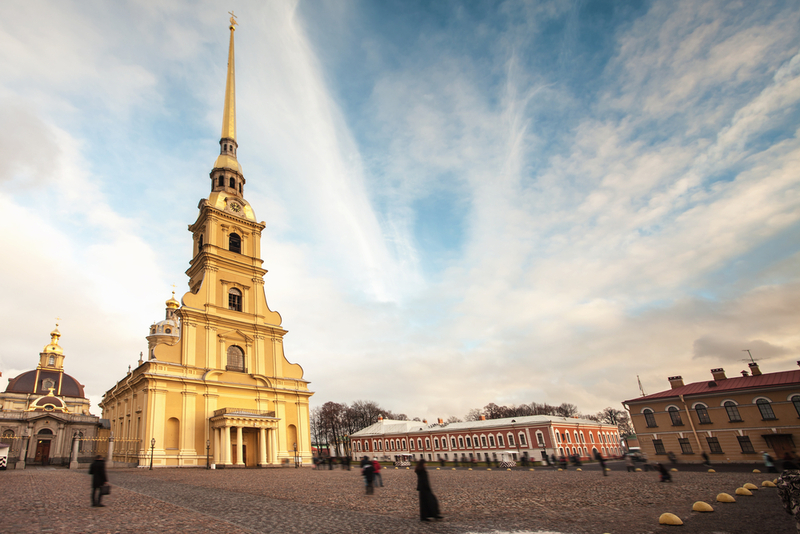 Situated within the Peter and Paul Fortress, the Peter and Paul Cathedral is St. Petersburg’s oldest landmark, dating all the way back to 1712. Just like with the fortress itself, the cathedral was also originally established by Peter the Great, with the cathedral’s bell tower being the tallest Orthodox bell tower in the world. Located inside the Peter and Paul Cathedral is the bell tower, which is instantly one of the most recognizable features of the cathedral, if not the entire fortress. The bell tower has a number of different functions, from being a lightning rod that protects the cathedral from any lightning strikes to serving as a viewing platform to visitors, to simply being an architectural symbol for the entire fortress. The Peter and Paul Fortress is home to a number of different permanent and temporary exhibitions that have been provided by the St. Petersburg Museum of History. These are continuously changing, making a visit to the fortress well worthwhile even if you have already visited it in the past. The fortress also plays a huge role in one of the oldest urban traditions in the city, with the Naryshkin Bastion cannon being fired each and every day at noon, providing a huge thrill to visitors both young and old. The fortress also overlooks a sandy beach, which is used by sunbathing walruses in the winter, before being turned back over to human hands in the warmer months. With a whole host of exciting events, concerts and festivals, including the annual, world-famous Petrojazz festival, you are unlikely to run out of things to do when visiting the Peter and Paul Fortress. St. Petersburg is packed with a rich history, and the Peter and Paul Fortress is one of the best ways to experience this. The restoration of all of the historical aspects of the fortress makes it extremely easy to learn about and understand the importance that surrounded the fortress throughout history, giving you a whole new appreciation for the entire city itself.